For those who want the background on this unintended series, I discussed the origins of "Why Unbelievers Hate Christians" in "Making Money From End of the World Fears", the reading of which is optional but helpful. You may want to see "Crooks: Why Unbelievers Hate Christians Part 2" as well. Once again, I was listening to a podcast at work and chomping at the bit to gallop home and write an article on it. Christians have enough problems dealing with critics and mockers without some of us giving them reasons to do so. I could write articles on nutty people who profess the name of Christ as a career (as well as false teachers), but there are others who do it far better than I do. Unpopular Opinion Puffin's opinion is unpopular among some people. Still, this one bothers me, and I hope it can be an object lesson. Opal Covey is running for mayor of Toledo, Ohio. She's run four times before, and lost every time. The part I don't cotton to is that she makes the claim that God told her to do this. Later, she claimed that she won in the past, but the election was stolen. If she doesn't win this time, God will destroy Toledo. Chris Rosebrough asks, "What kid of God does this woman believe in?" Whoa! Restrain your equines! 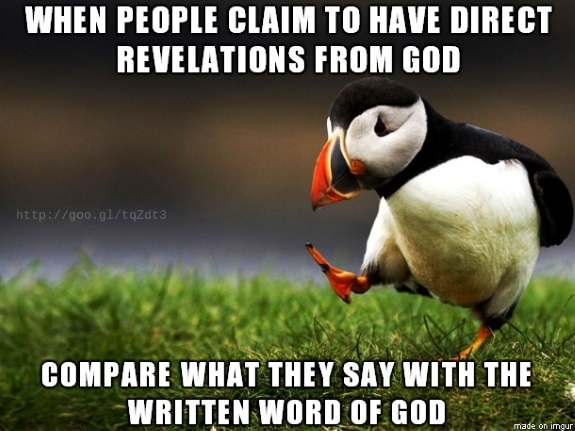 There are far too many people running around claiming to get direct, personal revelations from God. Worse, there are people who simply accept it as "a move of the Holy Spirit", and if you resist or object, you're resisting the Spirit. (I've heard of people wanting to do the right thing and checking a "word from God" with the real Word of God and being told that they're "blaspheming the Spirit"!) For that matter, giving "credit" to the Holy Spirit for misunderstandings of Scripture and false teaching is blasphemy in itself. Jesus said the Spirit will testify about him (John 15:26), not you, your special secret revelation, your bid for election, and especially false teachings. Give glory to God, not yourself. Watch who you're calling a blasphemer, blasphemer! This is prejudicial conjecture and bigotry. Smart Christians compare their actions with Scripture. If someone says, "God told me...", have them show you where it's written. What seems to be an all-access pass for these people is tongue-talking. If you cut loose in an unknown language against all the rules in Scripture (1 Cor. 12:10, 1 Cor. 12:30, 1 Cor. 14:27-28, 1 Cor. 14:40), then somehow you're considered legit, and your "prophesies" are on the level.. Not hardly! Satan counterfeits signs and wonders, but what passes as the biblical gift of tongues is actually nonsense, sorry to break it to you. And it is not a "secret prayer language" that makes you a spiritual hotshot, though many get full of pride on this. By the way, why would God need to work your vocal cords and mouth to build up your spirit? Such a claim is based on a Pentecostal or "Charismatic" tradition, which in turn is based on a misunderstanding of the biblical texts. News flash: the canon of Scripture is closed, we're not tacking on new "revelations" — especially on someone's say-so. I suspicion that some of these tinhorns are using their "gifts" to boost their egos as well as make money (Titus 1:11). Ask questions of these people. Not only have them show where their claim is supported in the Word of God, but if you can point out how they are violating Scripture, why should anyone then believe that their utterance is valid? They are manipulating people's emotions. When someone makes a claim about God, it needs to be check against God's Word, not tradition, opinion, or emotion. Too many of their followers are gullible, and lack biblical depth and discernment. To people who have depth of biblical knowledge and guidance of the Spirit, these fakers are quickly spotted, and often laughable. I need to be very clear on another point. Someone may say, "I believe that God led me to do such and so", well, that's a mighty far cry from a claim of having a direct revelation from God. We were warned that false prophets would come along (Matt. 24:24). People who claim to give prophesies are notorious for having a terrible record of accuracy. Even though the Bible gives the test of a prophet (Deut. 18:22), some feel that this does not apply since the New Testament began. This implies inconsistency on God's part, and people today are open to deception. Some of this come from the New Apostolic Reformation deception. Opal Covey was angry with Fred LeFebvre of radio station WIOT. She told him that he was resisting God's will, rebuked him, shook the dust off her feet, and then railed at him in "tongues". Now, I have no idea of what Fred's views are, but Fred showed a better understanding of the Bible than Opal did! From what I saw in the video, he acted in a professional manner. You can see the article and video here. I'm looking forward to adding to this article about her loss of the election and how Toledo is still standing. ADDENDUM 11-02-2015: Opal walked out on Scott Sands of WSPD during an interview today after he challenged her on the tongue-talking and being a "prophetess". I reckon he was a mite irked. Who wouldn't be? Also, she claimed she won, but the votes were stolen. Sure, you betcha. For more analysis, Chris Rosebrough of Fighting for the Faith discussed this incident (it's the podcast that got me all het up in the first place). My my reckoning, it begins at about the 14:55 mark. To listen for free or download, click here. In addition, here's his update on exceptional wackiness from Covey, starting at the 18:00 minute mark. When someone claims to have a direct revelation from God, check it with the Word. Most likely, your best bet is to saddle up and ride for the hills. But bring your Bible along, you can trust that. ADDENDUM 11-05-1959: Opal Covey came in last in the election, and Toledo is still standing. I guess who they elected is probably better than an addlepated charismaniac.